Libya's leader Moammar Gadhafi at the Quirinale Palace on June 10, 2009 in Rome, Italy. The Libyan leader will be issued a visa that limits his travel to New York City, a source close to the situation told NBCNewYork. And Washington, D.C. based representatives of the Libyan government informed Congressman Steve Rothman (D-NJ) that Gadhafi, will not be staying in Englewood, N.J. if he comes to the United States for the meeting of the United Nations General Assembly next month. 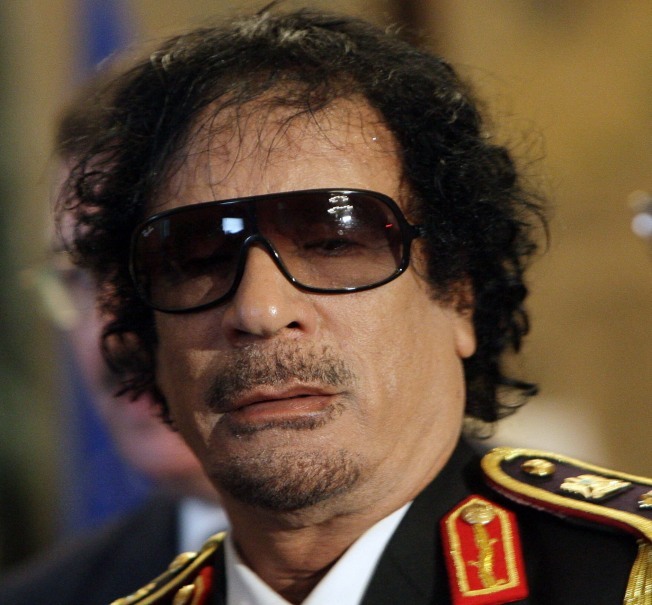 “I am very pleased that Moammar Gadhafi will not be coming to Englewood," said Rothman. "His appearance would have presented unnecessary safety and security issues for the residents of Englewood and the Libyan diplomats." The State Department wouldn't officially confirm the developments. The news come on the same day a northern New Jersey mayor went to court to stop renovation work at the mansion where Gadhafi wanted to stay next month when he addresses the United Nations General Assembly. Englewood Mayor Michael Wildes said if the federal government wouldn't do the right thing and keep Gadhafi out of a community where he's not welcome, he would. Libyan intelligence is widely believed to have orchestrated the 1988 attack on Pan American flight 103 over Lockerbie, Scotland, which killed all 259 aboard — including 38 people from New Jersey. Gadhafi gave a hero's welcome to the only man arrested in that attack when the bomber was released last week from a Scottish prison. Wildes said mansion workers have violated numerous city ordinances. Gadhafi's visit to the Garden State has rankled many Jersey politicians. Sen. Frank Lautenberg (D-NJ) wrote to Secretary of State Hillary Clinton this week, requesting that Gadhafi remain in a six block area around the U.N.
"Given recent events, I believe the State Department should ensure that Colonel Kadhafi's entry into the United States is for official UN business only and does not allow him to travel freely," Lautenberg said. In the hopes of stemming an international incident over the tent-pitching, Clinton was looking to arrange a hotel room or some other accommodations for the dictator, the Daily News reported on Wednesday. The topic dominated the daily State Department news briefing on Wednesday. "Of course our priority has been and will remain the families of the victims of this tragedy," State Department spokesman Ian Kelly said. "We're also talking to the Libyans to highlight the concerns that we have and the very raw sensibilities or sensitivities of the families who live in that area," Kelly said.